EDISON, N.J. (NOVEMBER 25, 2013) — SFA Saniflo donated a SANIGRIND PRO upflush grinder system to the SCI-Arc/Caltech team’s net-zero home entry for the U.S. Department of Energy’s biennial Solar Decathlon competition, held Oct. 3-13 in Irvine, Calif.
A team of architecture students from the Southern California Institute of Architecture (SCI-Arc) and engineering students from California Institute of Technology (Caltech) spent 18 months designing and building DALE—Dynamic Augmented Living Environment—a net-zero energy, solar-powered home for the competition. The one-of-its-kind, 600-sq. ft. micro-house features two movable, independent modules that sit on a rail system, enabling the homeowners to expand and contract their living space. “The use of the Saniflo grinder allowed us to facilitate the movement of the two house modules and enhance the possibility of our concept,” says Nicole Violani, public relations manager for the SCI-Arc/Caltech Team. About the size of a briefcase, the compact SANIGRIND PRO pump can discharge waste water not only from a toilet, but also from two other fixtures, such as a sink, a bathtub and shower, and even a clothes washer (indirectly through a laundry tub), notes Christopher Peterson, Western regional sales manager for Saniflo, who helped coordinate the SANIGRIND PRO product donation to the project. 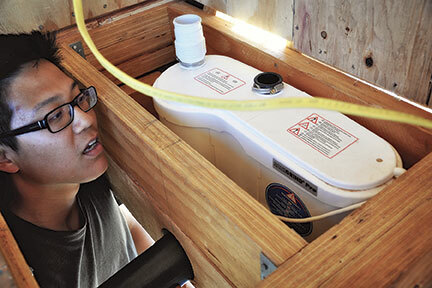 “Macerating, above-floor pump technology makes it possible to install a toilet or build an entire bathroom atop any finished floor —wherever it is most convenient—without having to break through a floor to make the plumbing drainage connections,” says Peterson, who visited with the SCI-Arc/Caltech team during the solar-home construction process. Flexible footprint: The SCI-Arc/Caltech DALE home entry offers an unprecedented flexible interior, allowing it to transform into a home three times its size. When an expansive living space is not needed, or when the night climate becomes cold, DALE’s modules come together, seal and require minimal energy to power the home, maximizing efficiency with a small footprint. This unique home was developed for the Solar Decathlon 2013, an international competition sponsored by the United States Department of Energy, which recognizes collegiate teams for designing, building and operating the most cost-effective, energy-efficient and functional solar-powered homes. “Increased awareness of energy and water efficiency is something we all should promote,” says Christopher Peterson of Saniflo. “Combining these concerns with Saniflo's ability to create faster, cleaner and smarter plumbing solutions was a natural fit. 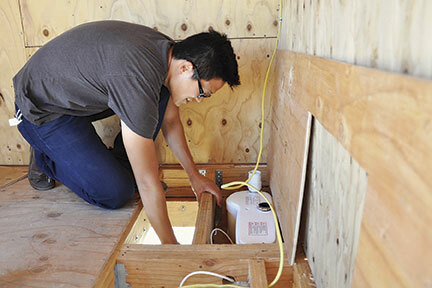 The Solar Decathlon competition is a biennial event sponsored by the U.S. Department of Energy in which university teams put forward proposals for the design of net-zero-energy solar powered homes. Twenty teams from around the world are selected to take part and are tasked with designing and building a green home. The competition culminates in the Solar Village, which will be on the runways of the Orange County Great Park in October, with public tours and a number of tasks that simulate the energy and water usage of a family living in the homes. 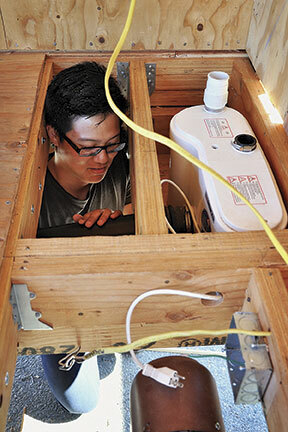 The Solar Decathlon challenges teams to design, build and operate solar-powered houses that are cost-effective, energy-efficient and attractive. The winner of the competition is the team that best blends affordability, consumer appeal and design excellence with optimal energy production and maximum efficiency. Open to the public and free of charge, the Solar Decathlon enables visitors to tour the houses, gather ideas to use in their own homes, and learn how energy-saving features can help them save money today. 815-469-9100 or john@greenhousedigitalpr.com; or visit: http://saniflo.greenhousedigitalpr.com/archive/. To download an image file, click on the desired resolution (hi-res, 300 ppi, CMYK; or lo-res, 72 ppi, RGB) shown below. For hi-res images, a zip archive automatically downloads to your computer. Due to how various browers handle downloads, you may have to expand the zip archive manually. Lo-res images open in a separate window and can be saved to your computer (either through the “Save As...” command or with a right-click). Larger sizes may be available upon special request. 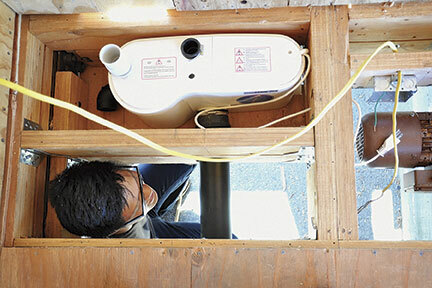 Below-floor installation of Sanigrind Pro grinder system, which handles waste water from a toilet and a sink inside the SCI-Arc/Caltech team’s net-zero home for the 2013 Solar Decathlon competition in Irvine, California. 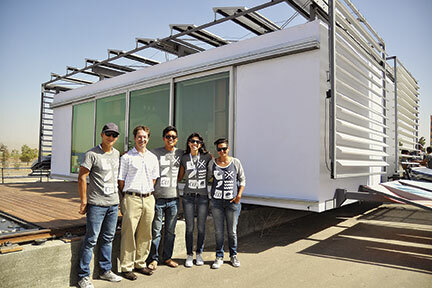 Saniflo Western regional sales manager Chris Peterson (second from left) with the SCI-Arc/Caltech Solar Decathlon team: (from left) Johnson Mac, Daniel Lee, Nicole Violani and Kristy Velasco. Directly behind them is DALE—Dynamic Augmented Living Environment—a net-zero energy, solar-powered home for the Solar Decathlon competition.